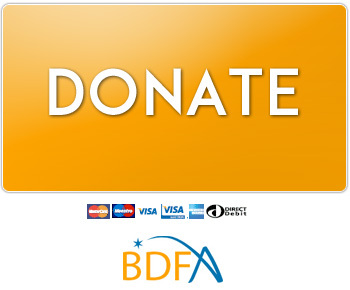 The BDFA website has been designed to be accessible to all. As a charity, we strive to show the same lack of discrimination that disease and disability do. Therefore we have created our website using standards-compliant XHTML and CSS coding, striving to meet the ‘AA’ access standards laid out by the World Wide Web Consortium (W3C). ‘AA’ standards are those recommended by the RNIB. If you do have any difficulties accessing any of the content on our site, please contact info@bdfa-uk.org.uk describing the problem you’re having, and we’ll do what we can to help. Our website can be viewed in the majority of browsers. Certain documents on this website have been made available in formats suitable for you to download. You may need separate software to view and print the documents once you have saved them to your computer. PDFs are commonly viewed using Adobe Reader, which can be downloaded free of charge from Adobe’s website – http://www.adobe.com/products/acrobat/readstep2.html It is available for Windows, Mac, linux and other popular operating systems. Below you will find a step-by-step guide to enlarging the text in your internet browser. If you have also changed the settings in your operating system and find that this does not magnify the text enough to be useful, then it is worth investigating screen magnification software. The text in your browser window should now appear larger. If this is still too small for you then it may be that you need to look at other ways of enlarging the text on your screen, such as screen magnification software.